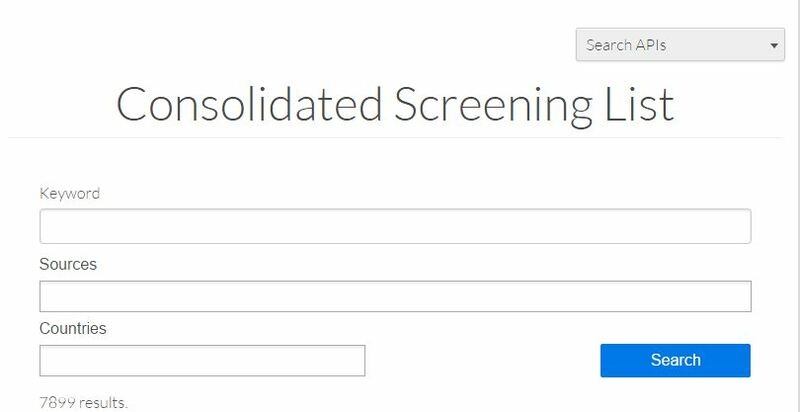 Starting today, U.S. companies can use a simple tool to search the federal government’s Consolidated Screening List (CSL). The CSL is a streamlined collection of nine different “screening lists” from the U.S. Departments of Commerce, State, and the Treasury that contains names of individuals and companies with whom a U.S. company may not be allowed to do business due to U.S. export regulations, sanctions, or other restrictions. If a company or individual appears on the list, U.S. firms must do further research into the individual or company in accordance with the administering agency’s rules before doing business with them. It is extremely important for U.S. businesses to consult the CSL before doing business with a foreign entity to ensure it is not flagged on any of the agency lists. The U.S. agencies that maintain these lists have targeted these entities for various national security and foreign policy reasons, including illegally exporting arms, violating U.S. sanctions, and trafficking narcotics. By consolidating these lists into one collection, the CSL helps support President Obama’s Export Control Reform (ECR) initiative, which is designed to enhance U.S. national security. In addition to using the simple search tool, the CSL is now available to developers through the International Trade Administration (ITA) Developer Portal (http://developer.trade.gov). The Consolidated Screening List API (Application Programming Interface) enables computers to freely access the CSL in an open, machine-readable format. By making the CSL available as an API, developers and designers can create new tools, websites or mobile apps to access the CSL and display the results, allowing private sector innovation to help disseminate this critical information in ways most helpful to business users. For example, a freight forwarder could integrate this API into its processes and it could automatically check to see if any recipients are on any of these lists, thereby strengthening national security. During the process of creating the API, the Commerce Department’s International Trade Administration and Bureau of Industry and Security worked with the Departments of the Treasury and State to form an authoritative, up to date, and easily searchable list with over 8,000 company and individual names and their aliases. These improvements provide options to the downloadable CSL files currently on export.gov/ecr. In early January, ITA also will release a more comprehensive search tool. This new API, along with Monday’s announcement of a new Deputy Chief Data Officer and Data Advisory Council, is another step in fulfilling Commerce’s “Open for Business Agenda” data priority to open up datasets that keep businesses more competitive, inform decisions that help make government smarter, and better inform citizens about their own communities.